Welcome to House Mikić, Brela! Our house is situated in a green and peaceful part of Brela called Šćit, 70 m above a pebble beach and 1000 m from the very centre of Brela. All our guests enjoy courtesy parking on our own car-park and parking garage. Some of the amenities located within a walking distance from our house are as follows: a small shop 50 m from the house, tennis courts, table tennis, mini golf and a beautiful footway along pine trees by the sea that is perfect for walking and bike riding. 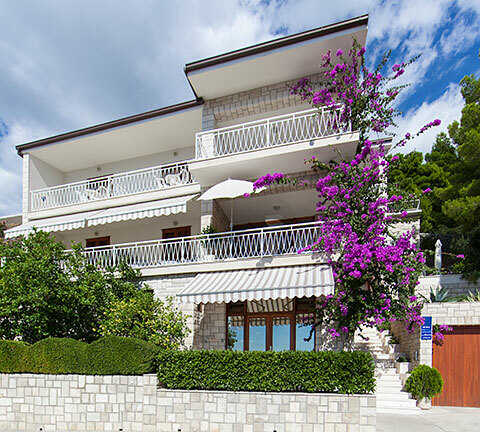 House Mikić offers 3 star rating apartments and bed & breakfast. 1. Apartment type A4+1 "Studio” on the ground-floor (separate entrance) is ideal for 4+1 persons. The apartment has 2 double bedrooms and one lavatory (shower and toilet), kitchen, satellite TV and a front terrace with a beautiful view of the sea. 2. Apartment type A6+1 on the attic is ideal for 6+1 persons. The apartment has 2 double bedrooms and 2 bathrooms (one bathroom is en-suite with a bathtub, the other one is next to the bedroom and with a shower), modern and fully-equipped kitchen with a bright dining and living area, satellite TV and a three-seat sofa that is readily converted into an extra bed for 2 persons. One bedroom has a balcony. The other one shares a large balcony with an impressive view of the sea and the surrounding islands together with the living room. 3. Spacious apartment type A10+2 on the second floor with 5 double bedrooms and 5 en-suite bathrooms (4 bedrooms have large balconies and a beautiful view of the sea) and one large, modern and fully-equipped kitchen with a satellite TV. The entire floor can be used as a spacious apartment for 10 up to 12 persons. 4. Bed and breakfast (B&B) in double bedrooms on the first floor. Each bedroom has an en-suite bathroom (with a bathtub) and a spacious balcony with a view of the sea. Breakfast is served either in a lounge, or on the front terrace. Dear guests, we invite you to spend great and unforgettable summer holidays in our house and with a friendly, German speaking family!